This sheet is the first in a series of laser cut Zimmerit patterns for various German AFV's. This debut release is a common pattern to Panther tanks. This release is designed to fit Tamiya's 1/35 scale Panther G early version, kit# 35170. We've been able to achieve a highly realistic finish in both terms of color and scale thickness. The etched paper offers several advantages over other products: No special clippers, files or bending tools needed. No priming for paint is necessary. No special glues or epoxies required. The zimmerit easily attaches to the primed model with ordinary white glue(PVA). No sanding to thin parts is needed. 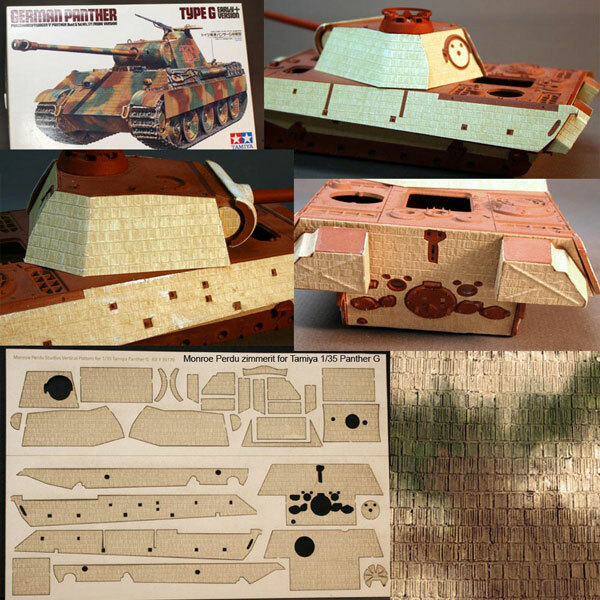 The paper is easily modified with a sharp blade to simulate battle damaged areas or specific patterns around tool mounts. This feature allows for complete customization of each tank project. The sheet also contains "extra" pieces for further customization of parts like fenders or schurzen. Complete application instructions are included. A full review will follow in the coming weeks.